This is a fast, energetic and exciting Latin style exercise style dance class that offers a great cardio work-out in a fun and friendly atmosphere. Suitable for the beginner or advanced dancer. Great workout for singles and couples. This is the latest dance fitness program. The program combines Latin and international music with dance in an effort to make exercise fun. Music is the key ingredient to Zumba classes. The score, created with specific beats and tempo changes, transitions the workout from one toning, strengthening or cardio move to another, and targets every major muscle group in the body. 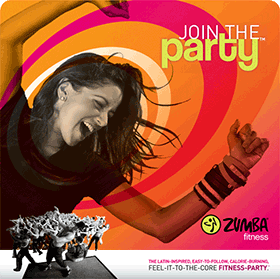 The Zumba program borrows from the following dance styles: Cumbia, Salsa, Merengue, Mambo, Flamenco, Cha Cha, Reggaeton, Samba, Belly Dancing, Bhangra, Hip Hop and Tango.